Enjoy close up views of your world anytime with the Kowa TSN-502 spotting scope. Small and light enough to always be with you whether at home, the park or trekking out in the hills. TSN-502 is fully waterproof and nitrogen filled, this tough little scope is designed to perform in harsh environments. Weighing only 400g, the TSN-502 spotting scope is light enough to take with you even on the longest treks and expeditions. 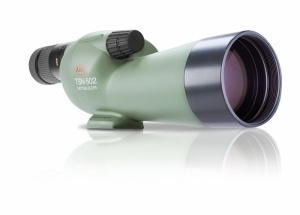 Measuring just 251mm in length the TSN-502 is extremely portable – the perfect choice for enjoying outdoor pursuits. TSN-502 series is the perfect choice for archery and target shooting, with a magnification of 20-40x – quickly observe your target in great clarity. With close focus performance down to just 2.5m – enjoy incredible detail of plants and insects at up to 40x magnification. The TSN-502 is so lightweight and easy to use for all ages, enjoy at home, at the range or out in the great outdoors. 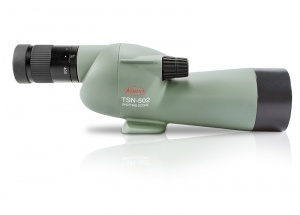 Enjoy close up views of nature anytime with the Kowa TSN-502 spotting scope. Small and light enough to always be with you whether at home, the park or trekking out in the hills. See flowers and insects with incredible detail using the close focus capabilities. A responsive focus wheel and smooth 20-40x twist zoom makes operation easy for any age. Kowa optical technology produces high resolution and clarity even in such a compact optic making a moment more memorable and immersive, then capture it forever with your smartphone using the Kowa smartphone adapter.